Read through our Ladybug Birthday Party ideas and incorporate the best birthday party ideas into your party. "Wan´t a Cool Ladybug Birthday Party!" Give each guest a ladybug antenna, when they arrive. This are made with headband, styrofoam balls and, pipe cleaners. Make Ladybug invitations with movable wings - when they open they reveal the party information. This Ladybug birthday party invitations are made out of black and red bristol board. Write the party information on the body of the ladybug in silver pen. Attach the wings to the body using a paper fastener. Put spots on the red wings. When you open the wings the party information is revealed. Use black envelopes. Or cut two ovals out of red and black construction paper. Paste black sticker dots on the red construction paper and print "Anna's 8th Birthday" across it, before that cut it in half the long way. On the black construction paper print the party details. Attach the red paper with paper fasteners, so that you have to open the "wings" to read the invitation. For this Ladybug birthday party your little princess should dress up as a Ladybug. Buy or make your own dress for your little girl. Make one by adding black spots to a red dress and let her wear it with black tights and a Ladybug antenna. Also, ask guests to dress up like Ladybugs. The theme colours for this Ladybug birthday party is black, red and anything with ladybugs. So hang lots of balloons and streamers in the theme colours. Create a giant garden for the ladybugs. Use coloured poster board or fabric to make giant butterflies, flowers etc. Attach them to the walls, doorway etc. Cover the party table with a red table cloth, place oreo cookie minis around the table to make spots, or cut out black circles from felt and glue or stitch it on. For centrepiece have a Ladybug Piñata. Invite the girls to make Ladybug key chains. Make beaded Ladybug key chains. Provide the girls with red and black beads and let the girls thread the beads. Knot the two ends of the thread together, and voila you have a Ladybug necklace. Invite the girls to decorate sugar cookies to look like Ladybugs using red frosting, black liquorice and oreo cookie minis. We have awesome Ladybug birthday party ideas for games and activities, just look below. Fill a jar with black and red jelly beans. Decorate the jar with Ladybug stickers on the lid. Ask each kid to guess how many beans there are in the jar. The kid who guesses right or closest to the right number gets the jar as a present. Let the girls play grasshopper, grasshopper. Lots of fun specially for younger children. Ladybug birthday party game similar to musical chairs. Cut leaves out of a large poster board. Place the leaves around the party room. Play music and let the girls fly around pretending to be ladybugs. When the music stops, they must find a leaf to land on. Ladybug birthday party game similar to Pin the Tail on the Donkey. Tape a green leaf on the wall, (cut out of a sheet of poster board). Also, cut paper ladybugs for each child. The player who places the ladybug onto or closest to the leaf will win. Children have to be blindfolded! Before the party cut out a big Ladybug body out of black and red poster board (red body and black legs and head). Put the poster on the floor and invite the kids, one by one to give Miss Ladybug "black spots". The kids will do this by tossing black bean bags onto Ladybugs body. This Ladybug birthday party game is similar to treasure hunt. Hide plastic Ladybugs (or anything to do with Ladybugs) around the party area. At game time, divide the kids into groups, give each group a small bag and ask them to find as many Ladybugs as possible. The group who finds the most, gets all of the Ladybugs as present. Get a Ladybug Piñata, fill the piñata with lots of red and black candies and lots of ladybug stickers. A good way to end a party is with a story. 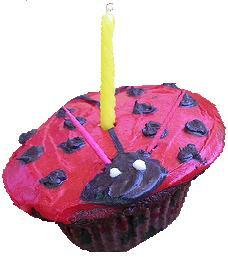 We have lots of yummy Ladybug birthday party ideas for food and drinks, have a look below. Mini Croissants: Serve mini croissants with soft cheese and ham. Ladybug Cookies: Make circle shaped cookies with red frosting and black spots, (brown M&Ms). Ladybug Cupcakes: Get some Ladybug clipart and glue it onto toothpicks, let it dry. Afterwards, stick the Ladybugs on the top of each cupcake. Make cupcakes and decorate them with red frosting and black spots, (brown M&Ms). Ice Cream: Serve strawberry ice ream with mini Oreo cookies. Punch: Make a red punch with lots of strawberries in it. Ladybug Soda: Colour the soda red. 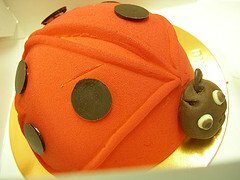 To make this Ladybug birthday party cake you need to make a regular round cake, with three layers. Ice each side of the layer so the cake will absorb the filling. Place cherry pie filling in between the layers. Get a baking spray colouring and turn the frosting ladybug red. For black dots, get oreo cookie minis and place them all over the cake. Or make a metal bowl to back a cake with a rounded top and flat bottom. Make red frosting and use oreo cookie minis for the spots and eyes. Use liquorice for the eye lashes, legs, and antennas. Dye coconut green, and use it as grass under the ladybug. Buy red lunch bags and use round black construction paper circles to decorate them. Fill the bags with Ladybug stickers, a colouring picture, a red pencil, a tiny bottle of bubbles (decorated with bug stickers), candy. Include the Ladybug key chains the girl's made. Take lots of pictures at the party, choose a picture of each guest, scan the picture and attach a Ladybug (get the Ladybug picture from the net) next to the girl in the picture. Print and send with a Thank You Note saying something like "Thank You For Coming To My Ladybug Birthday Party". Use black envelopes. I hope our Ladybug birthday party ideas will help you in your planning and I hope your princess will love and enjoy her Ladybug party. If you have good Ladybug birthday party ideas SHARE them with us. We and other parents around the world will appreciate it.